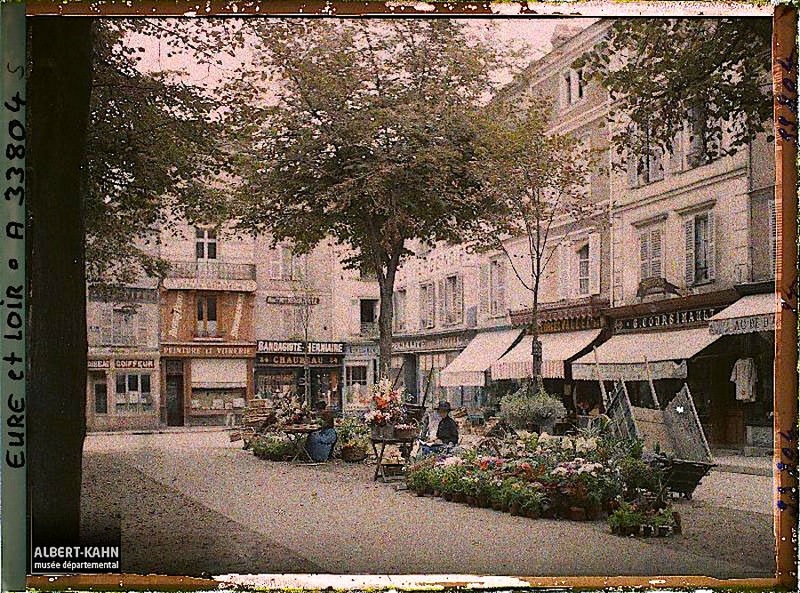 Le marché aux fleurs, Chartres, France, August 19, 1922, by Auguste Léon, via Archives of the Planet Collection – Albert Kahn Museum /Département des Hauts-de-Seine. One of my favorite blogs, It’s About Time by garden historian Barbara Wells Sarudy, is currently posting a series on paintings of flower sellers by American artists. Check it out here. *words of Albert Kahn, 1912. Also, the above photos (A 33804 S) are © Collection Archives de la Planète – Musée Albert-Kahn and used under its terms, here. Can’t decide if I like this French setup or the Japanese flower sellers more. All so evocative of their eras. Love the way the flower sellers have the same setup many years apart in Japan. I had found the Library of Congress Japanese print a few months ago. Then I was so happy to stumble over the photo last week. This French picture has such a sense of stillness.